Our Spring direct mail fund drive begins today. Please donate! KVRS paramedic Mike McMahon has been hired as the new regional Performance Improvement and Education Coordinator at the Tidewater EMS (TEMS) Council! We're proud to see yet another KVRS member assume a position of important responsibility in EMS. Even as a young man, Mike has many accomplishments under his belt and we know he has many more to look forward to. Best wishes, Mike! 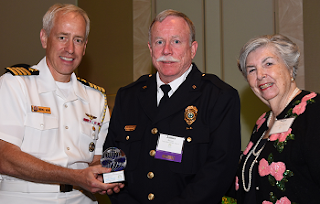 Our Life Member, past vice president, and long-time capital grant coordinator, Paramedic Jim Brewer, has received this year's Hampton Roads Volunteer Achievement Award in the Individual Adult category! This award recognizes the region's most outstanding volunteers based on their length of service, initiative and impact on the community. Among many other things, Jim's impact includes winning grants for the squad that have allowed the squad to deploy about $1,000,000 worth of apparatus and gear over time! Our top 500 donors are receiving copies of the Rescue Lines newsletter in the coming week. Our hope is to keep members of our community apprised of how our system is performing and improving. If resources allowed, we'd be sending it to every mailbox in our entire service area, but 500 is what we have on hand at the moment. We now have video laryngoscopes for all six of the ambulances in our fleet! This is important because sometimes we must insert a breathing tube into a patient's windpipe. We must be able to see the tube go through the patient's vocal cords, and that's not always easy to do with our own eyes. A video laryngoscope literally allows us to see around corners. The part of the tool that opens the patient's airway has a fiber-optic eye on its tip that transmits an image to an external display. Previously, this technology was only available to anesthesiologists in operating rooms. It makes a critical and tricky procedure faster, safer, and easier. The four devices we just added to our inventory are extremely cost effective at about $2800 each. Thanks to emergency grants from the state and the city, we've been able to place orders for two brand new ambulances to replace those destroyed by Hurricane Matthew! KVRS responded to more than 25 calls per day (transporting more than 17 patients per day) in 2016, average. Hurricane Matthew delivered disastrous flooding across the city, and as we worked to help people suffering illnesses and injuries, two of our ambulances sustained flooding that was bad enough that the vehicles were declared total losses. This represents an overnight loss of one-third of our fleet. Our Life Member and long-time President, Kevin Lipscomb, has been hired as a Division Chief at the Virginia Beach EMS Department. Our Vice President, Tom Kiernan, will be our Acting President until our Board Of Directors elects a replacement. Dan Kiernan, our Executive Officer, has been hired as a full-time Paramedic by the Virginia Beach EMS Department. Congratulations Dan, and best wishes for your new career! Our Scheduling Officer, Christina Powell, will be our Acting Executive Officer until our Board Of Directors elects a replacement. Our Life Member, Russell Blow, has been hired as a full-time Paramedic by the Virginia Beach EMS Department. Congratulations Russ! We've placed our brand new ambulance, "925" in service, thanks to donations from the community and a state Rescue Squad Assistance Fund grant. For the first time in our history, we have six ambulances in our fleet, and they all share the same basic custom-tailored design. This arrangement is critical to operational efficiency. 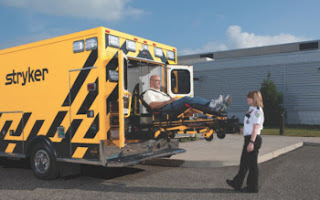 We won a $172,684 grant from the state Rescue Squad Assistance Fund and a $22,346 grant from the Virginia Beach Rescue Squad Foundation to complete projects to add a 6th badly needed ambulance to our fleet, and to outfit all our ambulances with safer Stryker Power-LOAD systems. We are still looking for about $101,000 in matching funds to complete these projects! 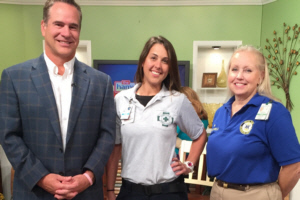 Our member, Paramedic Kate East (center, below), appeared with EMT Terry Connelly from our sister squad, Ocean Park, on the Hampton Roads Show today to talk about our system and how dependent we are on donations and recruits from the community. Today we made two documents publicly available in the hopes they may be helpful to other squads that are ordering new ambulances. The KVRS Ambulance Detailed Technical Requirements ( PDF | HTML ) and the KVRS Ambulance Graphics Package are full of lessons we've learned over four years of very detailed specification work. Scanner feed - details Sorry, your bowser does not support the audio control. Performing manual chest compressions during CPR is difficult, tiring, and impossible in certain situations. Quality varies from rescuer to rescuer, and deteriorates quickly after only one or two minutes. LUCAS is a safe and efficient CPR machine that standardizes chest compressions in accordance with the latest scientific guidelines. 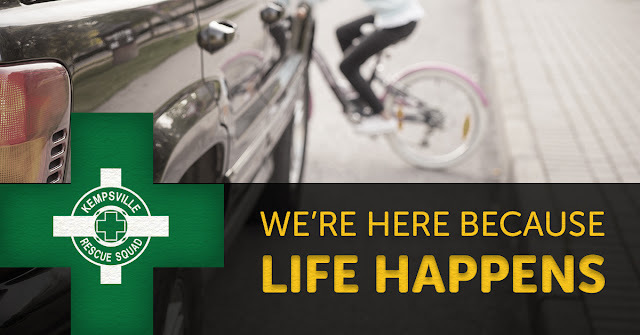 It never gets tired, doesn't have to stop when we're carrying the patient, and frees us to focus on other life-saving tasks. It also lets us strap into our seats on the way to the hospital, keeping us safer. We have these on our two front-line ambulances, but to best serve the community, we also need one on each of our other four ambulances. Neighborhoods listed in bold have civic league or HOA membership in the Virginia Beach Council Of Civic Organizations.